When you look at a group photo that you are in, who is the first person you look at? I’ll confess, I look at myself first. And then I get critical. Am I smiling? Hair OK? Eyes open? Good posture? Then I look at everyone else. Clearly this reveals a bit of self-centeredness, but sometimes we need to take a good long look at ourselves. We need to look beyond the image that we want others to see and peer into the reality of who we are and honestly evaluate ourselves. As we come to the end of this series on contentment, I think we need to understand that the most important thing to help us learn contentment is to see ourselves as people who live under the divine wise sovereignty of God. If that is the case, and I believe it is, when you look at your spiritual photo – do you see God? Do you see God’s workmanship? Do you see God’s hand in your circumstances? Do you see his wisdom? Do you see his love? Do you see his compassion? Do you see his ability to place you in the exact right place at the exact right time in the exact right circumstances to accomplish his glorious will for you? Contentment arrives the moment we come to peace with the fact that a loving and sovereign God directs all our circumstances. He made us. He is not subject to us. We are his creation. He is the Potter who made us for his purpose, and that purpose is to love him and to find great enjoyment in him. Contentment is recognizable in you if it is there. If you are content, you…. are silent before God. You don’t complain about, or beg him to change your circumstances. You pour your heart out to God, and then you trust his wisdom in all things. are thankful for all that you have and believe that your present condition is what is best for you. Not only are you thankful for what you have, you are thankful for what God has withheld. You see his mercy and grace surround you. are joyful despite your hardships. You accept that everything in life — the hurts, the issues that unsettle your soul, the mountains that seem insurmountable – have all been filtered through the hands of a loving father and are intended for your good. You see God’s intimate involvement in every area of your life lovingly directing, guiding, and disciplining you, and you are grateful that he loves you enough to mature you through difficulty. see that your hope does not depend on any outward thing. You see the grace of God in your salvation and know that your future is secure in him. Nothing can separate you from his love in Christ Jesus. have a consistent prayer life. You know that when you lay your heartache, hopes, desires, dreams, joys and plans before the Lord that he will do what is best and accomplish his perfect plan in you. choose to work in your circumstances rather than fight them. You see that God has you where he has you for a reason and you choose to work with him. You are willing to be refined. You are willing to unlearn useless things. You are willing to learn the truth. focus on others. You see that God has placed you in spheres of influence for his purpose and you work to serve his ends as you serve the people around you. choose to die to self and live for Christ. You see that God’s way is the best and that the only way to truly live is to die. Do you see this when you look at your photo? 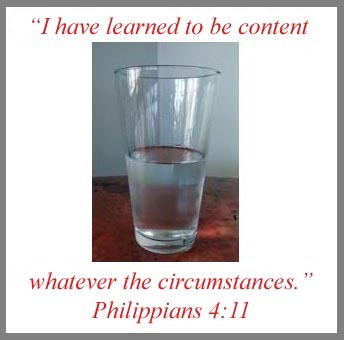 Are you learning contentment? It isn’t easy to learn, but it is worth the work. We come to terms with the reality of who we are in our world, in our relationships with others, and in our relationship with God when we embrace the truth that God is the one in control, not you, not me. And maybe, just maybe, when that is our reality, we will see a picture of someone who is learning to be content in all of his or her circumstances. This must be our reality – a heart of contentment – not just the image that we project. Anyone can look at our photos and see the image of contentment, but God looks at the heart. Is your heart content in him? That is what matters most. Yes, I need to work on contentment. Sometimes it is a long road! Thank you for your series on contentment and the list of what contentment looks like. This is a helpful tool to help me evaluate my heart. thank you, Sarah. While I’m glad the Lord put it on my heart to study and teach “contentment”, you can imagine what my summer has been like LOL. Fortunately, the one who teaches learns the most! Blessings to you!